IN A MISSIVE FROM THE 2009 WORLD HEALTH SUMMIT, KEVIN RUDD RECENTLY EXPLAINED THAT BY 2047 ALMOST 6% OF US WILL BE OVER 85 YEARS OLD. NEWBORNS, IT SEEMS, WILL GET A LONGER RUN AT IT TOO, WITH RESEARCH SHOWING THAT AT LEAST HALF THE BABIES BORN IN RICH COUNTRIES POST-2000 WILL REACH THEIR 100TH BIRTHDAY. With growing attention to what it means to be part of both an ageing society and a more generally ageist culture, artistic representations of, and collaborations with, those whom we call ‘the elderly’ are increasingly imperative. Conversations around the politics and ethics of such work are also vital: how might those who have slipped from visibility and vocality re-access the representational structures from which they have largely been erased? Theatre Kantanka’s Missing the Bus to David Jones, directed by Carlos Gomes, is one recent attempt to deal with the complexities of ageing that invite an equally complex praxis of theatre-making, storytelling, listening and watching. 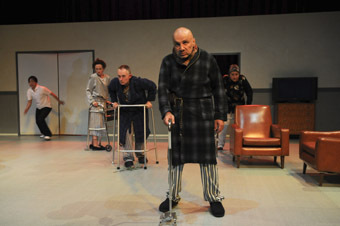 Set in an aged care facility that thrums with various foreboding decor clichés (the pineapple scent of disinfectant, the shiny vinyl of the easy-chairs; the calming LCD TV ‘entertainment centre’, the muffled AM radio), the space is instantly redolent with the uncomfortable sense that this is what we do with our old people in this country—those who now move slowly, who can’t bend, who forget mid-sentence. Despite our best intentions, we take those loved ones here to die. Missing the Bus is less a critique of the social, economic and family systems that feed an aged care cultural ‘mentality’, and more an investigation into what happens once you are inside such an institution. To make the work, Kantanka (Gomes, Valerie Berry, Rosie Lalevich, Arky Michael, Phillip Mills, Katia Molino, Kym Vercoe) engaged in a hefty research and consultation process that included visits to a range of aged care facilities—and with a mind to understanding their ethnic, economic and remedial differences—the undertaking of conversation, observation and assistance with what Gomes terms “the micro-universe of aged care.” Artists negotiated with staff, with residents and with families of residents, and then with aged care industry consultants at their first development showing. Missing the Bus is hence a theatrical—rather than documentary—reflection on ageing that is contemplated through a string of loosely interweaving vignettes and framed by video material (Joanne Saad) that sits in situ on the television set, and on a larger screen flanking the space. Narratives are sad, sentimental, cruel and ridiculous. The actors take on multiple character roles and are adept at feeling their way into the curvature of a sagging weakened spine (Vercoe), or into the verbal arrhythmias of frontal lobe impairment (Molino). We see (and contribute to in our looking) the shaming that happens when control over bodily functions is lost, and we witness the daily contradictions between despair and frivolity as characters live through their letting go of life. There are some striking images: a still, unmoving slumber opens the work to evoke a certain edge—this is the kind of sleep from which one may not wake. An extraordinary choreography realised by Kym Vercoe allows one character’s hands to delicately butterfly around the space and shyly seek out touch. A therapy balloon game is catapulted into disaster when the balloon is caught, it seems almost unsurprisingly, by dirty poo fingers.Flanking the performances, the video work sits tentatively between documentary and re-enactment genres to spin fantasy images out of the slowness of real time and into the conditional tense of imaginary past or future selves. Carlos Gomes describes the work as an “imprint of a set of experiences” and “a theatrical reaction to” the aged care “universe.” Audience reaction to this theatrical world might applaud the tight structure of the work, its thematic interest in ageing and the skills of the performers, whose mimicking of the aged seems to spring from an empathy conveyed through exacting repetition of bodily movements. 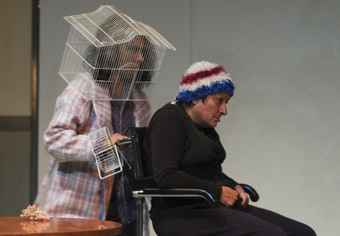 However, the relationship between the theatrical and the social can be vexed: representations of the new “otherness” called ageing are open to critique where they imitate their subjects. Verbatim theatre, on the other hand, ethically avoids mimicry while a company like Back to Back Theatre inclusively creates and performs works by its subjects. Disability studies stemmed from an earlier history of feminist and ethnic minority politics, and while a similar lineage in ageing studies might still be a while away, if ageing is the next frontier to be challenged, then Kantanka have made a genuine start.